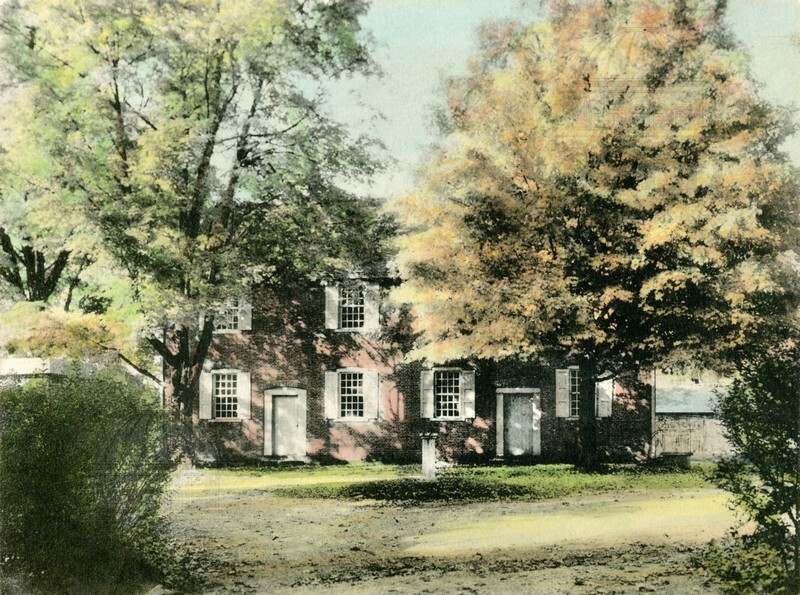 From the reverse: "One of the first substantial buildings in the Town of Washington was the Brick Meeting House, built in 1780 by the Society of Friends. The bricks used in its construction were manufactured in the immediate vicinity; the mortar in which the bricks were laid is at this day harder than the bricks themselves. The walls two feet in thickness, and true as when first built; the windows set in heavy sash frames; yellow-pine flooring, fastened to the timbers by wrought iron nails; the antiquated pews and unpainted columns which support the galleries, and which have not altered since the house was built; the huge rafters, a foot in thickness, which support the roof; these and other peculiarities fill the mind of the beholder with wonder. Time as yet has made little or no impression on the building." “The Brick Meeting House [Nine Partner's Meeting House],” Main & Market: Sights and Sounds of the Queen City and Beyond, accessed April 24, 2019, http://mainandmarket.poklib.org/items/show/3508.